On June 25, 1996, a truck laden with explosives ignited in front of the Khobar Towers apartment building in Dhahran, Saudi Arabia. The resulting explosion killed 19 American servicemen and wounded hundreds more. It was the second terrorist attack in that country within a year. In the early 1990s, a fundamentalist Islamist movement was gaining fervor in Saudi Arabia, and its leaders were enraged over the expansion of American and Western influence in that country. Much of their anger was directed at United States military personnel who had established a presence in Saudi Arabia following the 1991 Persian Gulf War. In November 1995, a group of radical Sunni Muslims expressed their rage by setting off a bomb at a Saudi Arabian National Guard facility in the capital city of Riyadh, killing five Americans. The Saudi government in May of the next year executed four of the men involved in the bombing. Following the attack, U.S. intelligence officials uncovered additional threats against American military personnel in Saudi Arabia, but no specific information that would lead them to believe another attack was imminent. In 1996 more than 3,000 U.S. service personnel were living in the Khobar Towers apartment complex in the port city of Dhahran. On the night of June 25, guards on the roof of the complex were alerted when they noticed two men running from a truck parked near one of the buildings. They acted quickly, but could do nothing to stop the massive explosion that followed. The truck, which was loaded with at least 5,000 pounds of plastic explosives, (larger than the bomb that destroyed the Alfred P. Murrah Federal building in Oklahoma City the previous year) set off an explosion that tore off the northeast side of Building 131, killing 19 Americans and wounding approximately 500 Americans and Saudis. After the attack, President William J. Clinton announced a "declaration on terrorism," and called upon other world leaders to join in the fight against international terrorists. The Secretary of Defense appointed a task force to investigate the incident, and began implementing measures to protect against future attacks. The investigation. Soon after the attack, a local wing of the Lebanon-based militant group Hezbollah claimed responsibility. Terrorism experts extrapolated that Iran also played a role in the bombing, in part because it backs the Hezbollah. Iranian officials denied playing a role in the attack, and claimed that the terrorists were not in their country. Saudi officials asserted that the bombing was the work of Saudi dissidents who were aided by Iran. Although the Saudis rounded up several suspects, they were reluctant to share information with the CIA and FBI, and were unwilling to provide the Americans with access to the detainees. In March 1997, a Saudi citizen named Hani Abdel Rahim Hussein Al-Sayegh was arrested in Canada. American authorities later claimed he gave the signal for the bombing. Following a nearly five-year investigation, on June 21, 2001, a federal grand jury in Virginia indicted thirteen Saudis and a Lebanese man on charges of murder and conspiracy in the Khobar Towers bombing. Nine of the men were charged with forty-six criminal counts, ranging from conspiracy to kill Americans and employees of the United States, to bombing and murder. The other five men were charged with five counts each. According to the indictment, all fourteen men were members of Hezbollah, working on orders from Iranian government officials to disrupt the American military presence in Saudi Arabia. According to the Saudi government, many of the named individuals were already in custody at the time of the indictment. Ferguson, Amanda, and Nancy L. Stair. The Attack on U.S. Servicemen at Khobar Towers in Saudi Arabia on June 25, 1996. New York: Rosen Publishing Group, 2003. 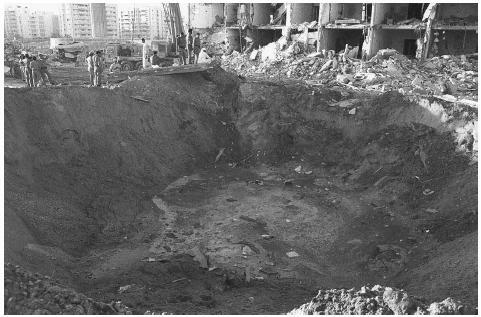 A crater 35 feet deep and 85 feet wide was made by a truck bomb exploded at the Khobar Towers in Dhahran, Saudi Arabia. The bomb killed 19 American servicemen and wounded hundreds more. Duffy, Brian. "Terror in the Gulf: Bombs in the Desert" U.S. News & World Report. July 8, 1996: 28–32.